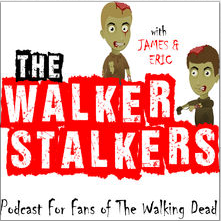 In this special episode of our podcast we present an interview we did with James and Eric from the Walker Stalkers podcast. They are also the brains behind the successful Walker Stalker Convention which happened this month. They tell us some of their favorite moments of the convention. Get a heads-up on a special discount for returning attendees to the con. We had a blast recording this episode. We would really appreciate if you subscribed to our podcast in iTunes or any of the other audio apps.